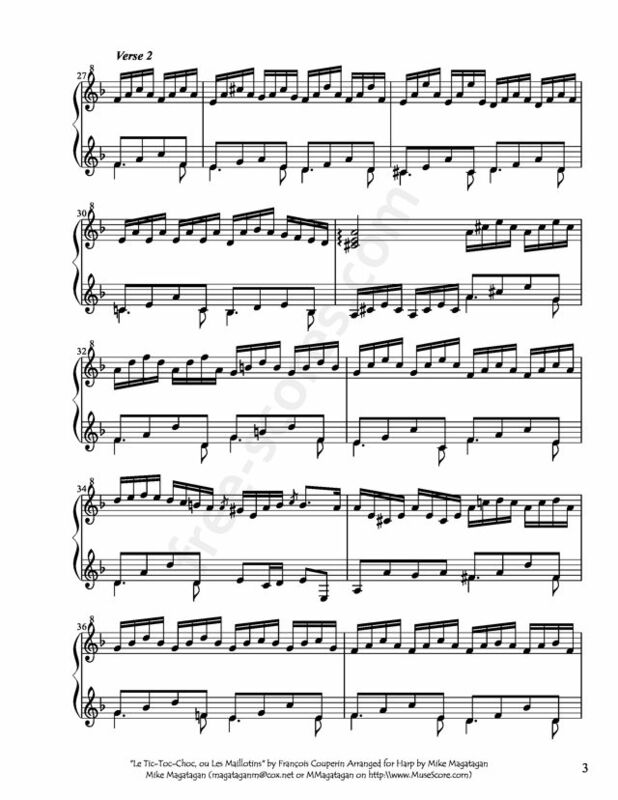 "Le Tic-Toc-Choc, ou les Maillotins" is from Ordre XVIII, composed in 1722 by François Couperin. Of all the harpsichord repertoire, the works penned by the French Baroque composers were intrinsically wedded to the instrument. 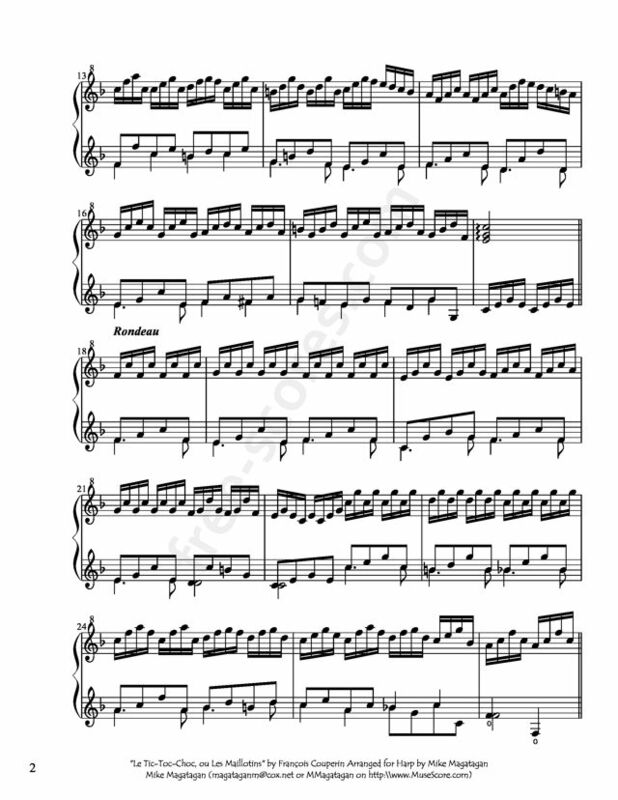 One of the most remarkable pieces in the entire harpsichord repertoire is "Le Tic-Toc-Choc", a pièce croisée from his Dixhuitiéme Ordre published in his Troisième Livre of 1722. The piece is discussed in Jane Clark and Derek Connon?s recent book, ?The mirror of human life? : Reflections on François Couperin?s Pièces de Clavecin, where it is revealed that the Maillot were a famous family of rope-dancers. "Tic toc; an indeclinable and artificial term, which expresses a beating, a reiterated movement, a pulse that beats, a horse that walks, the pendulum of a clock, a hammer that knocks". Nobody seems to know for sure what the title means, but many think it's the name of a child's toy. 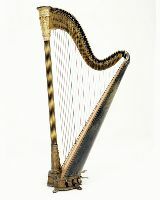 He wrote that this work as a keyboard crossed part: "to be played on two manuals, of which one will push or draw back. Those who do not have a suitable harpsichord or virginal must play the top part as written and the bottom part an octave lower". I created this arrangement for Harp seperating the staffs and using the latter approach for playability. 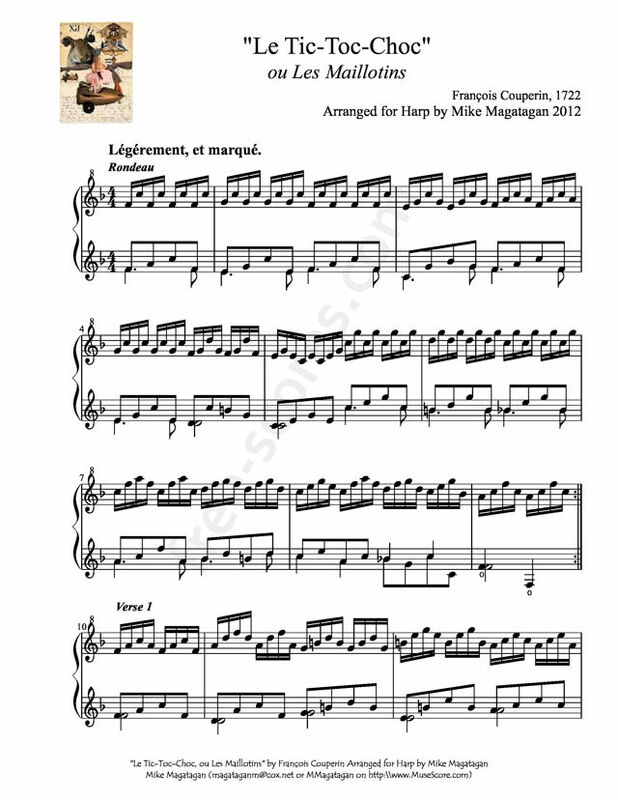 Although originally written for Harpsichord, I created this arrangement for Concert (Pedal) Harp.